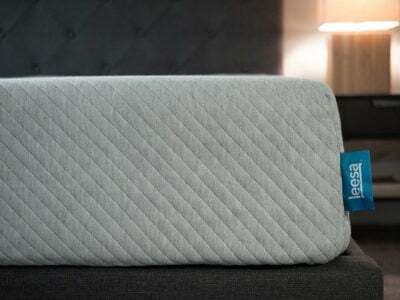 JetComfy’s innovative design makes it an especially handy pillow to have on a plane. You will soon be wondering why you didn’t think of it yourself. But is it really the perfect travel pillow? Read my full JetComfy Travel Pillow review for more info. 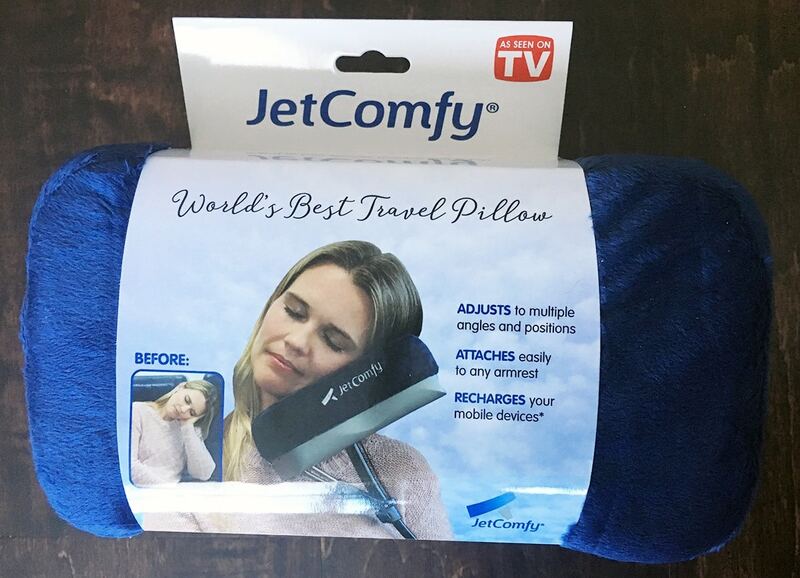 See where JetComfy lands on my best travel pillows page! 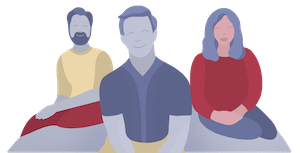 JetComfy is the brainchild of a product designer and a businessman who met at a hotel bar while on vacation. After discovering they both felt uncomfortable when traveling, they developed the idea of the JetComfy travel pillow. The JetComfy does not look – or feel – like your everyday travel pillow. 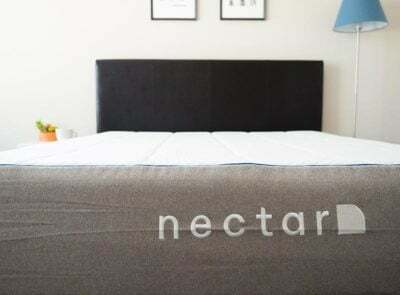 It’s made from a combination of lightweight aluminum, plastic, and soft memory foam. Once you figure out how to set it up (I needed to watch the promotional video on JetComfy’s website) you will wonder how you didn’t come up with this idea yourself. The pillow feels more like an apparatus or a contraption when you first assemble it. It’s like a small aluminum/plastic/memory foam layered brick (a lightweight brick!). But once I set it up and pressed my head onto the soft pillow top, I understood why this is such a popular travel pillow. 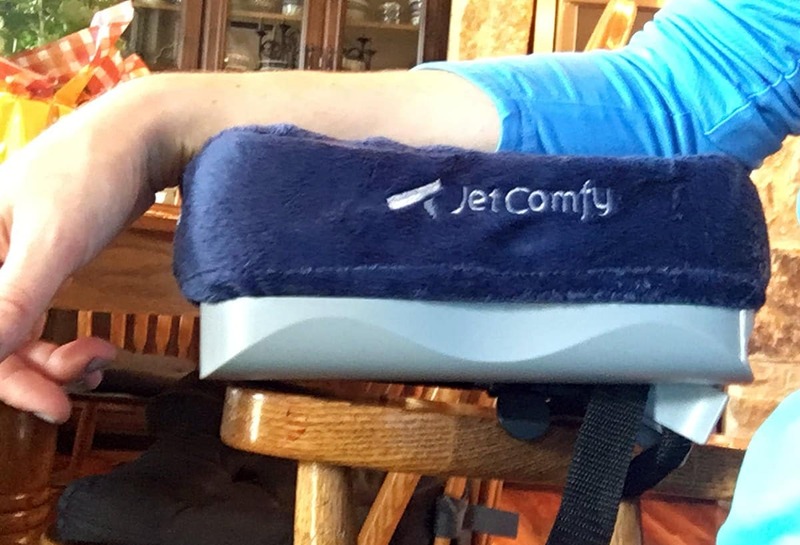 JetComfy essentially acts as an extra arm for your armrest. The aluminum pole is adjustable and swivels and tilts to your comfort, so all you need to do attach it to the armrest on the seat of the plane, lay your head on the memory foam pillow top and close your eyes. 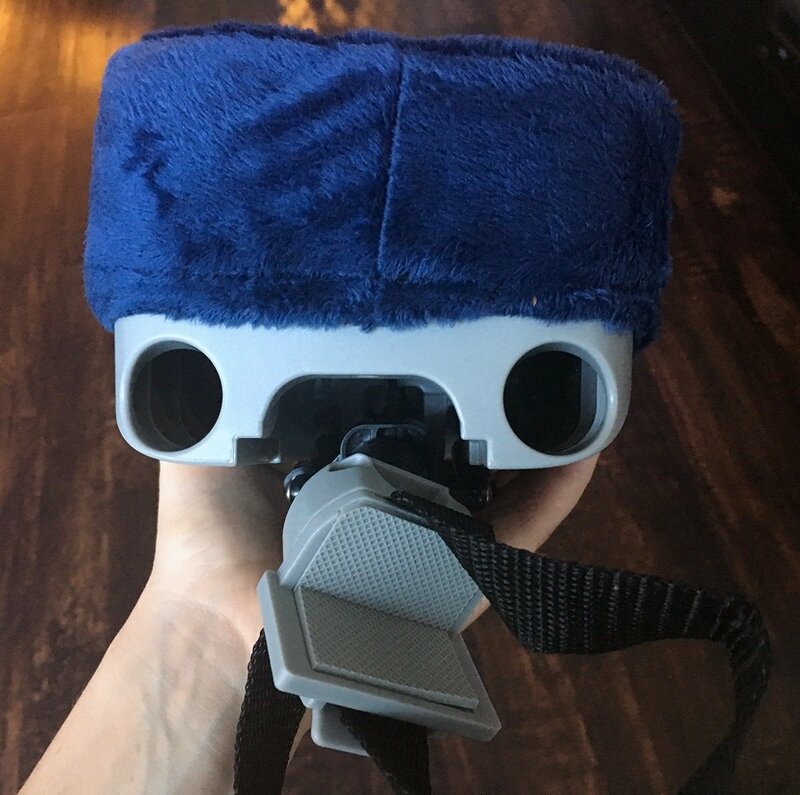 The cover is a soft and plush microfiber (comes in grey and blue) and is removable. I couldn’t find specific care instructions for the cover so I washed it in a cold gentle cycle separately and a low tumble dry and it came out just fine. 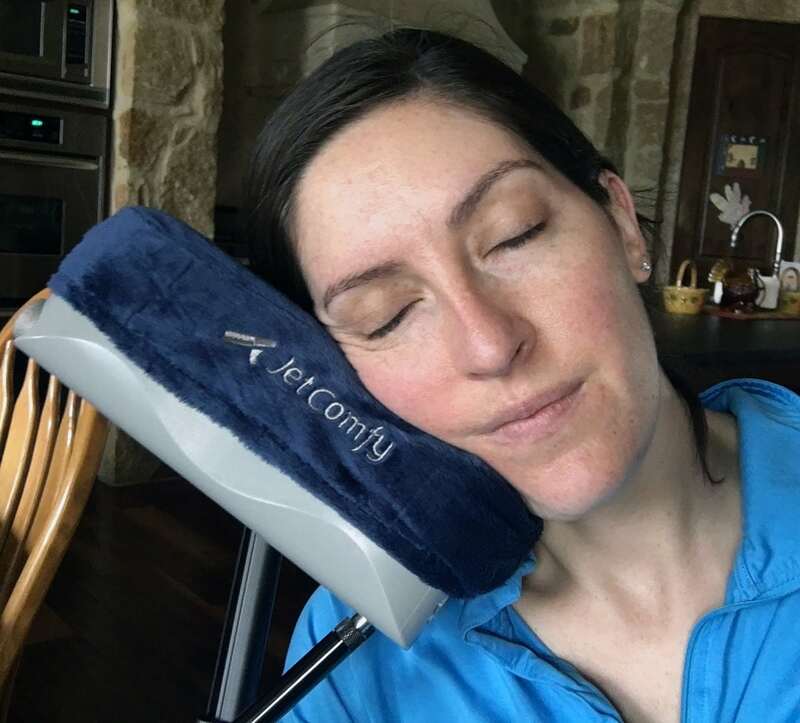 I think the JetComfy is a great travel pillow for people who are traveling on planes, trains or in cars that have the right armrest. 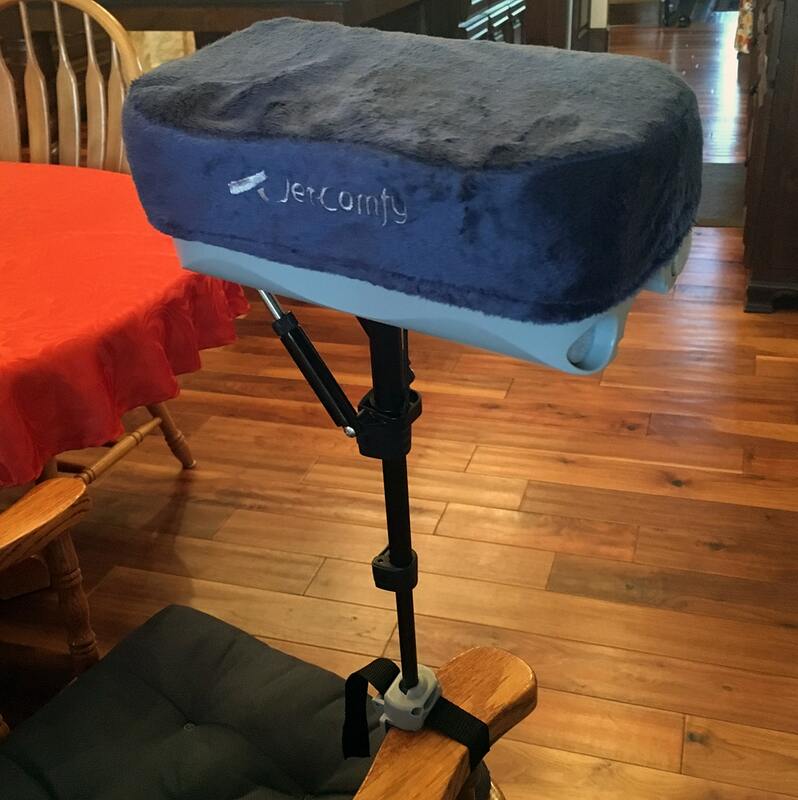 You need to be able to strap the base of the JetComfy pillow onto something. The website says you can use the non-stick grip to just place the pillow base on most surfaces, but I had a hard time feeling like the pillow was stable unless it was strapped down with completely. There are two cars in my family and sadly neither of them have adjustable armrests or armrests that allow me to strap this pillow on so I was unable to try it in my car. However, based on my experience with the pillow on my office chair I can see this being handy addition for a road trip with kids if there are bucket seats in the back. 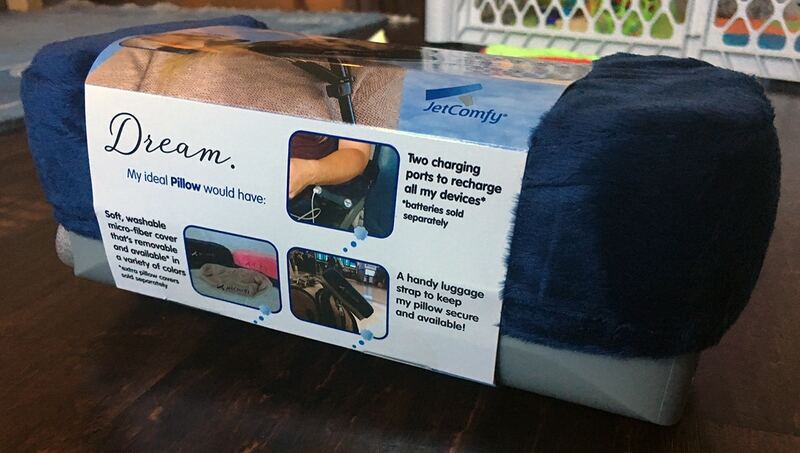 The folks at JetComfy promote USB power chargers that can be placed inside the pillow. Not only can you get some decent rest, but you can also keep your phone or electronic device fully powered. They also have a tool that functions as a pen, stylus, and lighter that you can put in the pillow as well. Very handy when you’re on an overnight flight and it’s dark and you need to look for something. 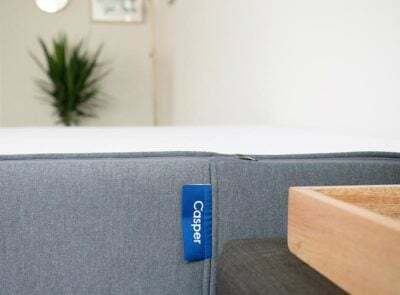 The bad news is that both of these great options (plus an extra pillow cover) are only available in the Upgrade Kit that is sold separately for $29.99. The pillow is $49.99 on its own which makes it nearly $80 for the whole package before tax and shipping. Once I watched the video on JetComfy that shows you how to unfold the pillow and strap it to your armrest, it was really easy to do. I love how customizable it is as well. I think you could honestly sleep pretty hard with this pillow (as long as it’s strapped to the armrest very tightly). Overall this pillow is inventive and comfortable. 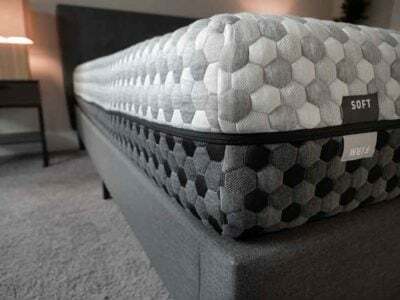 It has the ability to be a little bulky because it is heavier than most pillows. There are some accessories that make the pillow even more useful but they are sold separately. Overall I would recommend the pillow if you were going on a long or overnight plane trip (or train trip). A solid, flat and sturdy armrest is essential to keeping the pillow stable. If you want the pillow and all the additional accessories, get ready to pay nearly $80 for the pillow. And make sure you’ve got an armrest or place to strap the pillow that is stable and can hold the weight from your head and neck when you actually use the pillow. A few customers had issues with the stability of the aluminum pole and being able to lean on it fully without it slipping. And some also found issues with the size and bulk of the pillow. 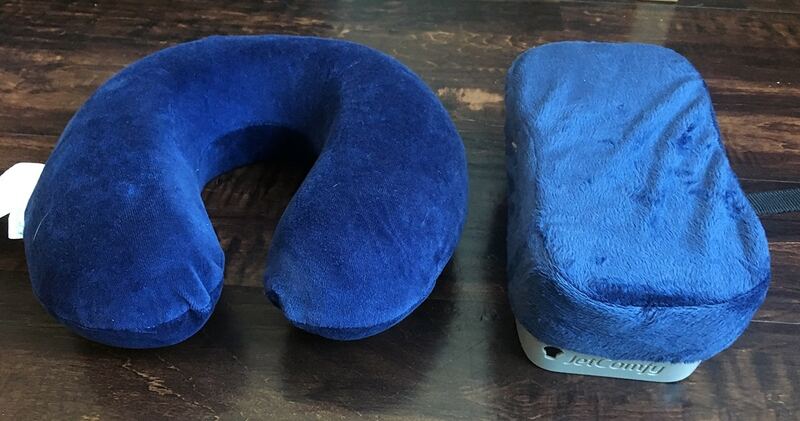 While it is heavier than some travel pillows, it is not much larger than a standard neck pillow (this is the Travelmate neck pillow). 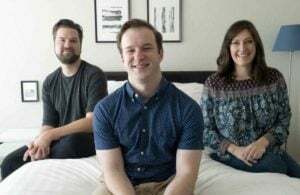 While the JetComfy website says that the pillow conforms to TSA 2016 guidelines but several customers said they had awkward experiences explaining the pillow to TSA employees when going through security. The pillow will take up valuable real estate on one of the armrests on a plane. 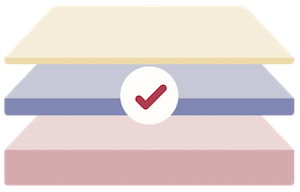 It is also pretty different looking so you should be prepared for some looks and/or questions from your seatmates and other passengers. The JetComfy pillow is not cheap, but it’s not your average travel pillow, either. The pillow retails for $49.99 on JetComfy’s website and on Amazon. The Upgrade Kit costs $29.99 and this includes 2 USB mobile charging ports, a 4-in-1 pen/stylus/pointer/light, and an extra pillow cover grey. 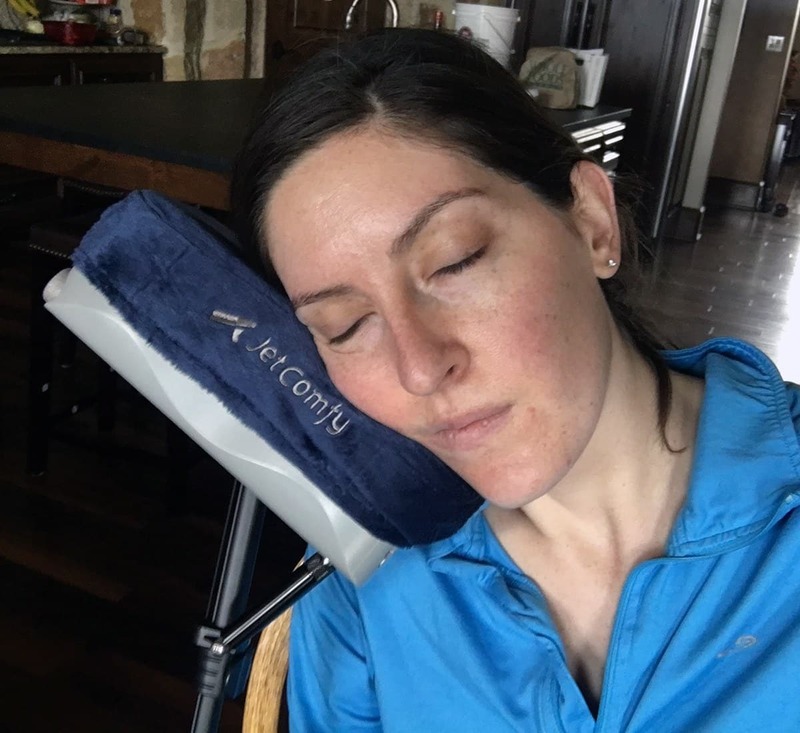 It is hard to compare this to another travel pillow because of what it offers, but I would encourage everyone to think carefully about where they would want to use this pillow – and if it’s possible to attach the base of the pillow to that seat – before purchasing. Thanks for the great and in depth review!